Sealed Tenders are invited from RBI approved Security Printers (for Security Items only) for supply of Bank’s Printed Stationery. Click Here For Tender Notice. Sealed Tenders are invited by the Bank from manufactures/Authorized Distributors/Authorized Dealers dealing in Computer papers for supply of computer Papers (58 GSM) with Bank’s Logo printed on it. Sealed Tenders are invited for Citizens' Cooperative Bank Ltd., Tender for AMC of Desktops/Laptops & other Allied accessories. 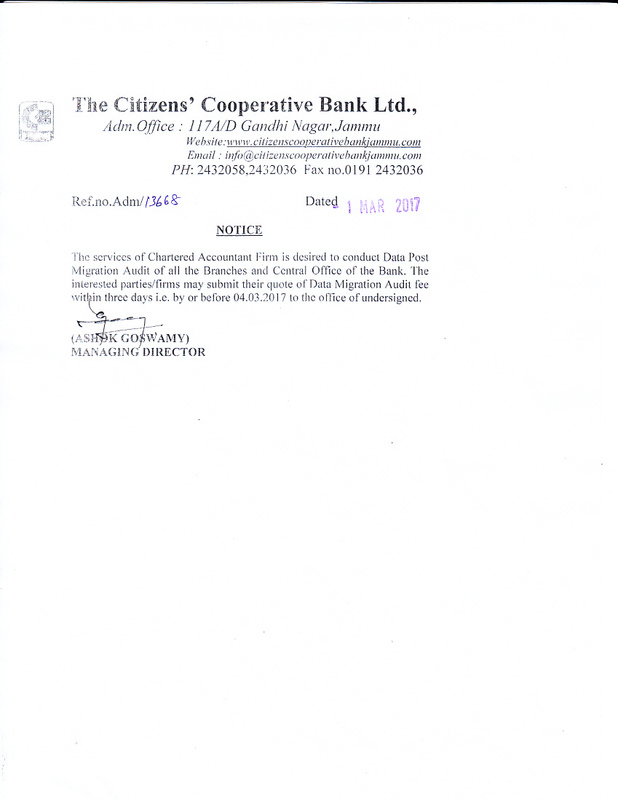 Terms and Conditions & Tender Form for Citizens' Cooperative Bank Ltd. Sealed Tenders are invited from RBI approved Security Printers (for Security Items only) for supply of Bank’s Printed Stationery . Sealed Tender are invited from RBI approved Security Printers for supply of Bank’s Printed Stationery. (ii) 10 KVA Oil Cooled Servo Stabilizer. Sealed Tender are invited for Supply and Commissioning of :- Note Counting Machines- Upto 5 Nos in different Branches of the bank. Sealed Tender are invited from RBI approved firms for supply of Bank’s Printed Stationery . Short Term quotations are invited by the Bank for Computer data feeding job and electric earthing of the branches from interested parties having expertise and experience in Computer Data feeding of Banks/Institution. Tender Document For Supply of Bank’s Printed Stationery - CTS-2010 Standard Cheque Forms. 2016 © The Citizens&apos; Co-operative Bank Ltd. Jammu. Jammu. All Rights Reserved. Powered by : Ideogram Technology Solutions Pvt. Ltd.